The ELS Cloud provides users the flexibility of creating models on your local desktop and the solving speed of a high performance computing environment, all on a budget that doesn’t break the bank. By providing you with the tools to easily create full 3D models for nonlinear structural dynamic analysis and the processing power to solve complex 3D nonlinear dynamic structural simulations, we give you the freedom to imagine new possibilities for performance based design and build a better future for us all. The ELS modeler allows users to easily create 3D solid element models by eliminating the need for transition elements, allowing the user to easily model all reinforcement details rather than smearing them in the material, and eliminating the need to manually place placing plastic hinges. This allows you to focus on creating an accurate 3D model, rather than creating assumptions and relying solely on engineering experience. Once you complete your model, simply upload them to the ELS Cloud for processing so your system isn’t bogged down with resource intense analysis. As the analysis progresses you can log into your account and view results and catch any issues before the simulation is complete. With the Extreme Loading® for Structures Solver, you’re capable of performing fully nonlinear static or dynamic analysis that follows the behavior of structures through separation, collision and collapse. Yielding of Reinforcement: automatically calculates material strain from elastic to plastic deformation. Plastic Hinge Formation: automatically places plastic hinges. Buckling and Post-buckling: automatically calculates elastic and plastic bending under compressive loads. Crack Propagation: automatically calculates the location and propagation of cracks. Membrane Action & P-Delta Effect(P-Δ): automatically calculates the dynamic force and displacement caused by Membrane Action and the P-Delta Effect. Separation of Elements: automatically separates elements based on nonlinear material properties. Collision and Collapse: automatically calculates the collision and collapse of separated elements. The frame by frame output viewer in ELS allows users to view simulation data in real-time, perform a number of post processing tasks, and create presentation materials in a variety of formats. 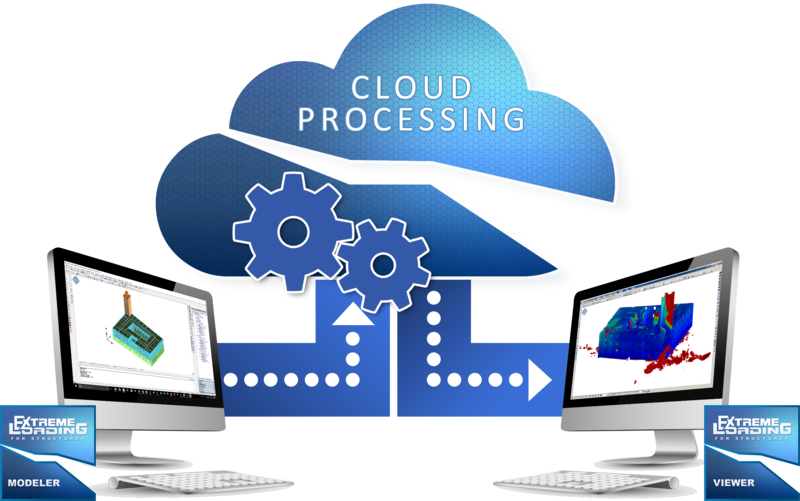 The ELS Cloud leverages the ELS simulation platform and supports end-to-end simulation workflows – including pre-processing, graphical post-processing, and data management. Enjoy the flexibility to choose the batch only solutions for short term projects or the end-to-end solution for full access to simulation on the cloud, minimizing the time and cost of moving files. The ELS Cloud ensures end-user productivity via complete job and data management in a web-based user environment. ELS Cloud unleashes the power of its unique AEM solver with significantly faster computational time on high-performance computing for breakthrough workloads that were never before possible. This solution includes high performance GUI/Graphics, storage, and scale-able access to additional resources in the ELS Cloud. The ELS Cloud is a turnkey solution that has been tested and certified by ASI Engineers. ASI’s rapid provisioning will ensure that you are up and running in days, without a costly internal investment of hardware procurement, configuration, and maintenance.